The Joburg SPAR Women’s Challenge is proud to have professional runner Rene Kalmer as our official race patron and ambassador. 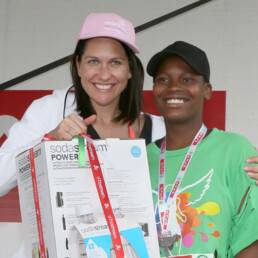 With over 20 years of experience worn into her running shoes, Rene is a well-known name in the SPAR Women’s Challenge world and a long time participant in the Joburg race and in the SPAR Grand Prix Series. Rene is among the most versatile female distance runners ever produced in South Africa and is one of the country’s top distance runners. She has won an astonishing 40 SA titles, starting with the u.15 cross-country title in 1995, and first represented South Africa as a junior in the 1996 World XC Championships at the age of 15. She has an unprecedented string of 27 victories in the SPAR Women’s Challenge Grand Prix Series, stretching from her first win in 1998 to her most recent victory in August 2012. In addition to being the official ambassador for the Joburg SPAR Women’s Challenge, Rene is also the patron of the SPAR Grand Prix series.